You are here: Home » Uncategorized » Why Celebrate Nobel Laureates? 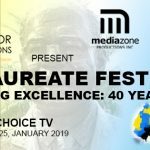 The Nobel Laureate Festival in Saint Lucia took place in January 2019 but there are two more events taking place in February and March. The other videos feature on Facebook page Nobel Laureate Festival: Saint Lucia.